In March 1995, members of a Japanese cult released the deadly nerve agent sarin into the Tokyo subway system, killing a dozen people and injuring a thousand more. "We can't just rip out and replace the affected concrete — that would be too expensive," said Tenney. "We need to decontaminate it and make it safe. The public has to be confident enough to come back and use the affected facility." The project, funded by Sandia's Laboratory Directed Research & Development program, uses computer simulations to examine how chemical agents soak into and bind within concrete. The power of the simulations is that researchers can glimpse details they can't obtain experimentally. Researchers can expose a concrete block to a chemical, try to clean it and then detect the remaining chemicals, but that doesn't allow them to watch what is happening on the inside, Tenney explained. Decontaminating concrete is difficult because it's chemically and physically complex. Tenney said he and his team need details of the chemical interactions that occur in concrete so they can design new decontamination methods and mixtures. Like a cake, the recipe for concrete can change depending on how spongy, or porous, it needs to be, but the major ingredients remain the same. Roasted and finely ground limestone and clay make up the "flour," which is mixed with water to form the gluey "dough" called cement. Concrete is just cement with sand or gravel added to bulk up the mix. Other ingredients can be added to tweak properties, such as the time it takes to set. On the chemical level, cement is made up of many minerals including aluminosilicates from clay, calcium oxide of quicklime and even potassium hydroxide from potash. But the most important component is amorphous calcium silicate hydrate, the "glue of the glue," said Matteo. Cement loves water and is extremely alkaline. All this affects how chemicals react with concrete. In addition to its chemical complexity, concrete is intricately spongy and thus really hard to clean up. It may not look like it from the outside, but concrete is full of microscopic pores that allow a concrete structure to grab onto chemicals and sometimes "breathe" them back out. That means even if the concrete surface is cleaned, dangerous chemicals from an event could still be hiding deep inside. Building upon Sandia's long-standing expertise in molecular-scale geochemical simulations, Tenney and his team modeled several long-lasting, oily chemical agents to see how they react and move within tiny water-loving concrete pores: where they spend their time and how they degrade. 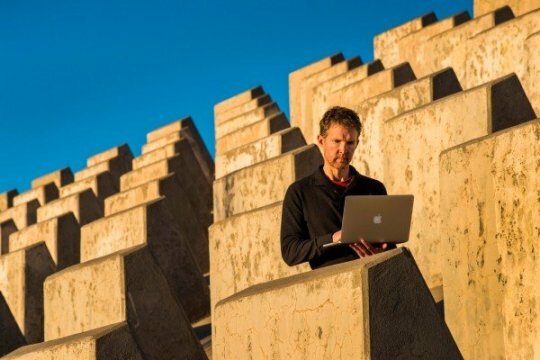 Building on that knowledge and his expertise in atomic-scale models of chemical reactions, Chris O'Brien, a computational materials science postdoctoral researcher, looked at how chemical agents degrade in concrete. He modeled an agent bound to several representative concrete environments and watched how this interaction hastened or slowed the natural break-down process. He plans to expand to other chemical agents, time and funding permitting. The team will use the results to determine the best way to decontaminate concrete exposed to nasty chemicals. One strength of the computer models is that they allow fairly rapid evaluation of different possible decontamination solutions, often much faster than experiments. This will let Tenney's team screen many different formulations to see which ones are best at pulling agents out of concrete or away from each other. Another future goal is to experimentally test these new decontamination methods on concrete contaminated with sample chemicals to validate the insights gained from the computer modeling. The above post is reprinted from materials provided by Sandia National Laboratories. Note: Content may be edited for style and length.